There is a wide range of products made to alleviate back pain by correcting posture. One of the most unique products I’ve found is the Plexus Micro Wheel. This review answers these questions – Does it work? Does it correct posture? Plexus began in Saratoga Springs in 2015 in a spare corner of the founder’s garage, where he began developing the Plexus ‘Yoga’ Wheel. These wheels were created and initially marketed to help yogis improve their balance and flexibility. Soon after the Plexus ‘Yogi’ Wheel launched, they became increasingly popular with all sorts of people who wanted to use the wheel to apply pressure to a range of muscle groups. For this reason, Plexus chose to develop three different wheel sizes; the standard, the medium, and the micro, with each wheel design following the 5-inch rule, meaning that they fit perfectly between the user’s shoulder blades, allowing the entire back to be rolled out. Since their initial wheel design, Plexus has developed several patented back pain solutions. An online yoga program has also been launched, showing yogis how to effectively use the Plexus ‘Yogi’ Wheel to help improve theirs’ and their students’ mobility and spinal health. There are three different Plexus Wheels, each of which offers varying levels of pressure. The larger the wheel design, the more support it offers the user’s back. The smaller the wheel, the easier it is to target specific muscle groups. The standard 12-inch wheel offers gentle pressure and can be used to relax the upper and lower back – this size is for people five foot tall and above. The medium 10-inch wheel offers medium pressure and can be used to relax the hips by opening them up – this size wheel is for people five foot tall and below. The micro six-inch wheel offers deep tissue pressure, corrects posture, and targets specific muscle groups – this wheel is suitable for all heights. The Plexus Micro Wheel was designed to be a back pain reducing product that also improves posture while sitting. It is made to provide traction to the spine, removing pressure from the disks. The wheel does deep tissue pressure to help relieve muscle tension while effortlessly improving the user’s posture. Due to its small size, the Plexus Micro Wheel is ideal for traveling with, and can also be used for a leg massage. Despite its small size, the Plexus Micro Wheel can support up to 500 Ibs of weight. The smaller size of the Plexus Micro Wheel is great because it’s easy to transport around, which makes it ideal for use at home and work, as well as traveling. 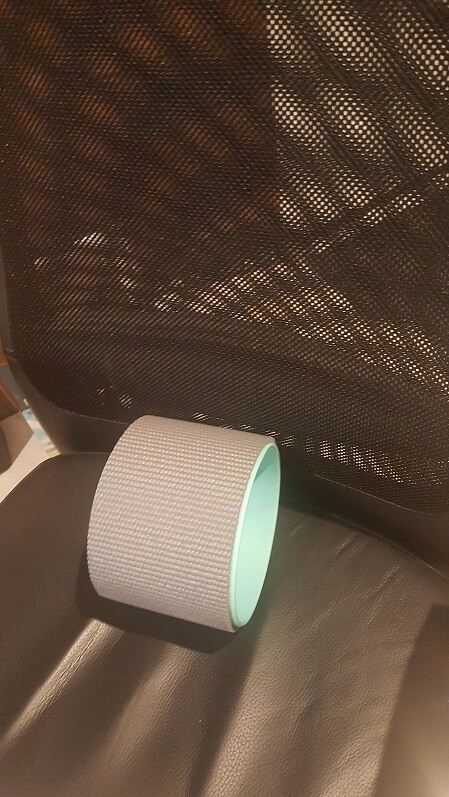 I love this product since it’s so easy to use – there is no easier way to improve your posture than by sitting at your desk and putting the wheel behind you. All you have to do is slot it behind your lower back, and you can sit back and relax while the wheel does the work. There’s no straps or clips – it isn’t fiddly or complicated. I sometimes sit there for 5 minutes trying to get my straps untangled on both the Better Back and the BackUp by Nada Back because they have to be strapped on if you want good posture at your desk. However, with this wheel, there’s no straps or clips to worry about, which is great. Like every product, there are a few downsides to this wheel, one of which is that the posture support that it provides is limited. I would say that I get about 80% posture support when using this. I am still able to lean forward slightly, and my shoulders can still slump a little. Also, because it’s thin, it can hit a few points in the back, which after a long time can cause some soreness in these areas. Of course, this is a small price to pay for improving your posture quickly and easily. I like to use this wheel on and off throughout the day. It’s a great device for posture correction and support and is much easier to use than a complicated brace. No need to put on a long back support brace. Keeps feet on the floor when in use. 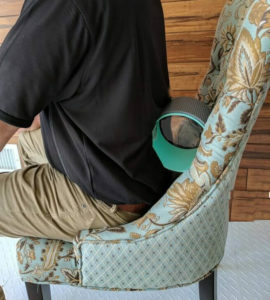 Prevents slouching and improves posture. Can cause some soreness, but is very minimal. For improving your posture, the Plexus Micro Wheel is a fantastic tool. It’s easy to use even when sitting, it prevents slouching and fixes bad posture quickly and effectively.